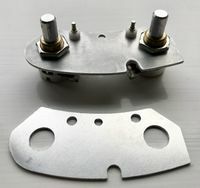 Material: 1.2 mm thick 5251 H22 grade aluminium sheet. Spindle: industrial HF spindle from StoneyCNC. 2 mm 2 flute solid carbide slot drill (REVERSE ROTATION). 12 passes at 0.1 mm depth per pass. As you can see the aluminium granulates nicely and generates small mobile chips which clear easily with these conservative parameters. I suspect the Stepcraft system would cut quicker and with slightly greater depth per pass but I have no requirement to push the boundary on the small geometries associated with this project. I did not apply any compressed air cooling as you can see and there was little or no heat build up in either the stock or bit. That said, I did pause between the six pocket cuts to remove gum from the double sided adhesive tape and swarf from the end of the cutter with a cloth and isopropyl alcohol.